Exciting days are looming for our 30 business teams who have been working hard down at the track to prepare for the 2013 WHK Corporate Pursuit. This Sunday they will put themselves against the clock for the Team Time Trial with the first team scheduled for take off at 12.25pm. Entry is just a gold coin donation so head on down and cheer them along! The main event is the following Sunday 11 August from 9.30am and it’s promising to deliver some very stiff competition if the recent roller racing rounds are anything to go by. Again public entry is just a gold coin donation so make sure you tell as many people as you can to head on down and cheer for their favourites! The WHK Corporate Pursuit is definitely a highlight on the Cycling Southland calendar and if you haven’t found out why then the next two Sundays are certainly a chance to rectify that. So we look forward to catching you up over the coming weekends! Good luck to all teams with their final preparation and performances on the day – most of all make sure you have a tonne of fun! This will be followed by the ILT Junior Track Carnival on October Tuesday 8 and Wednesday 9. Have you ever thought that you would like to become a Volunteer on the Tour of Southland Cycle Race and didn’t know how to go about it? The Tour of Southland is on the lookout for extra volunteers to assist with the 2013 Tour. If you are interested in lending your support to this proud and iconic Southland sporting event click for more information and to register. Because this Wednesday 31 July is the Cycling Southland AGM (and all members should be attending!) BOW and WOW won’t be a coached session. Anyone who still wants to ride during the usual BOW /WOW slot are welcome to come along and just have a roll around for the hour. A reminder it is not too late to sign up for the Junior Division Road Camp at Tuatapere from Friday night 23 August, coming home Sunday afternoon 25 August. If there are any parents wanting to come please let Andrea know also so we can confirm numbers etc. Also Junior Division is currently undertaking a fundraising drive for the 2014 Road Nationals in Cambridge. If you are thinking of going and would like to benefit from any funds raised to help offset costs please let Andrea know so you can be put on the list to help with the various events they have planned. Corporate pursuit lunch packs for Sunday 11 August are one of the first fundraising events so if you are able to help by either making sandwiches or salad rolls, muffins or fruit, please let Andrea know so she can co-ordinate to make sure we get the right quantities of each item. andreajohn@xtra.co.nz or text 027 345 9381 and don’t forget to say who you are. Please note that the Great Southern Cycle Challenge has now been scheduled for the 19 October. The Myross Bush Points Race which was scheduled for the 19 October has now been swapped to the 12, and the Bunty Hewitt Memorial remains on 13 October. The Road Programme online has been updated accordingly. With it being our 50th anniversary this year we thought it was a good excuse to celebrate this special occasion with as many people as possible that have ensured our great club has succeeded so much over the years. So to anyone who has been a rider, official, volunteer, sponsor, spouse, spectator, supporter of our club you are all invited to join with us over the weekend of the 15th –17 November to celebrate in style. Official registrations and further details will be made available online in the near future. 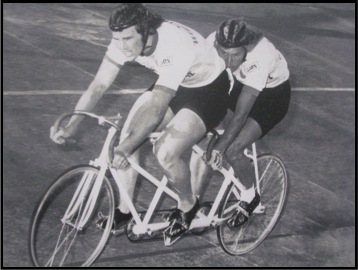 For those that are extra keen why not stay on to enjoy the Oceania Track Championships which start on 19 November. Be in quick as we know there are already some of our Australian friends booking their airline tickets. Pass the word around we want as many people as possible associated with us to come join in the celebrations. Calling all interested road riders this television-produced fundraiser wants you to join them for the first leg of their national fundraising campaign for Cure Kids and Red Nose Day and it starts this Friday night.